You’re a Linux user, so naturally you’re not Microsoft’s biggest fan. But even you have to admit: Microsoft’s Bing has really nice photos on the home page. You like looking at those pictures, but refuse to use Bing. What’s a Linux user to do? Set up their desktop wallpaper to use those pretty pictures, that’s what! This gives you all the pretty pictures with none of the actual Binginess. And more than one open source enthusiast has designed tools for doing just this. Let’s highlight two options: one that’s easy to use, but has a watermark, and one that’s a littler trickier, but is watermark-free. 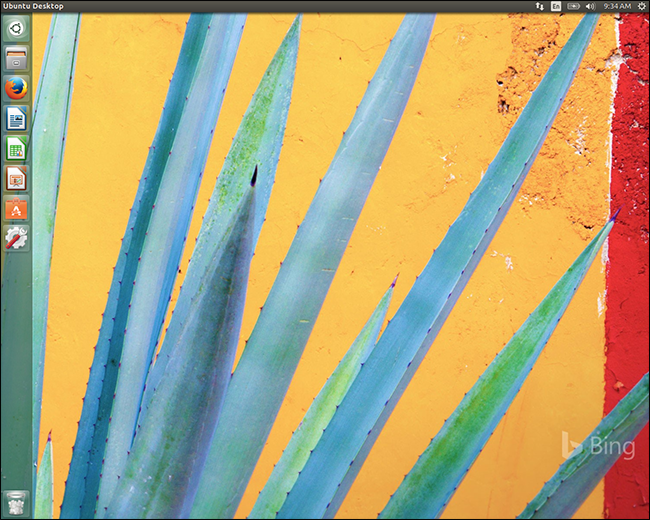 Our first selection automatically runs when you log into Ubuntu, and checks Bing every four hours for new wallpapers. The program works in GNOME, Cinnamon, Unity and Xfce environments. The first command adds the Whizzzkid PPA, which offers the software we want. The second command updates our package manager, so we can see the new software. 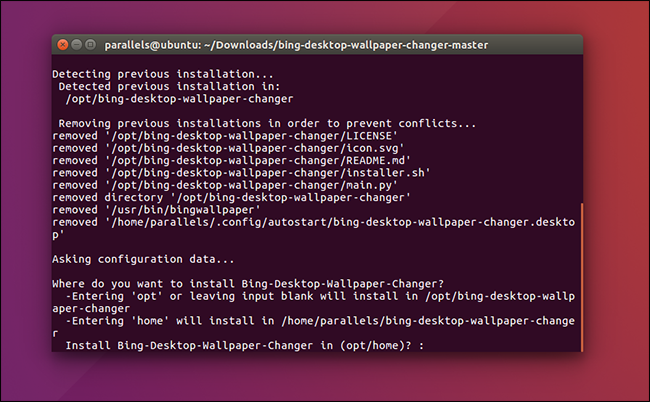 The third command installs bingwallpaper, the package that we want. This program, once installed, will run in the background every time you log into Ubuntu. Basically, once it’s installed, your wallpaper will be set automatically, without you having to do anything. Your wallpaper will automatically change to today’s Bing background. Enjoy! The only downside: It’ll show the Bing watermark over your image. I’m not thrilled about that, to be honest. 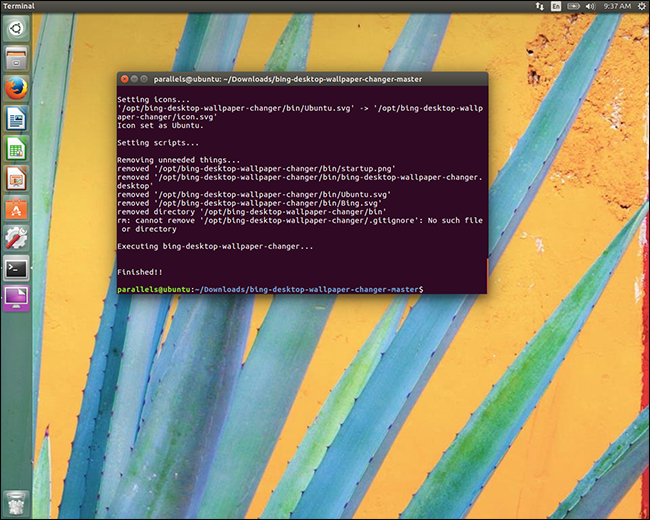 If you like this idea, but aren’t thrilled by the Bing watermark over the wallpaper, I suggest a Python script called Bing Desktop Wallpaper Changer instead. It’s slightly trickier to install, but it also starts itself at boot and also automatically downloads new Bing wallpapers every day. You just can’t install this with Ubuntu’s package manager. Instead, you need to download the latest version of the script, then head to your Downloads folder and extract the ZIP file. And now we’re going to run the installer script. You will be asked whether to install the script to /opt, which you should do unless you specifically do not want to. You’ll also be asked about whether you want to create an alias for the program, and whether you want the script to automatically start at boot. We recommend you do both—you can always uninstall it later. When the process is complete, your wallpaper will automatically change to the latest Bing wallpaper, sans watermark. This is slightly more complicated, but the lack of watermark makes it all worthwhile. Enjoy your new wallpapers every day!